I’m sure most home cooks have their own recipe for Shepherd’s Pie but this is our family favourite. My mum used to make it using the left over lamb or beef from a Sunday roast minced through a hand mincer and I would hold the bowl underneath for her. We don’t tend to get huge joints like that anymore unless it’s a special occasion but we’re getting great quality mince from our butchers. 1. On a medium flame, gently heat the olive oil. Fry the onions in the oil until they are slightly brown – about 5 minutes. 2. 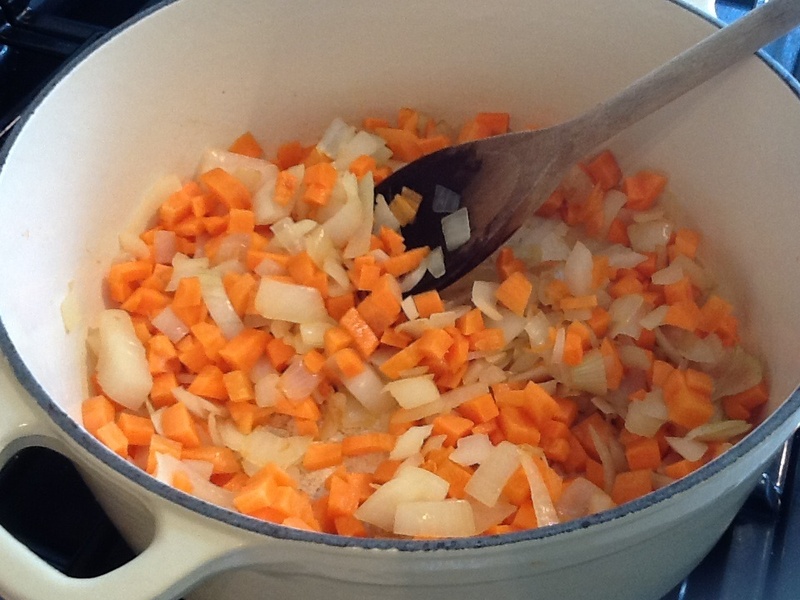 Add the chopped carrot and cook gently for 10 minutes. 3. 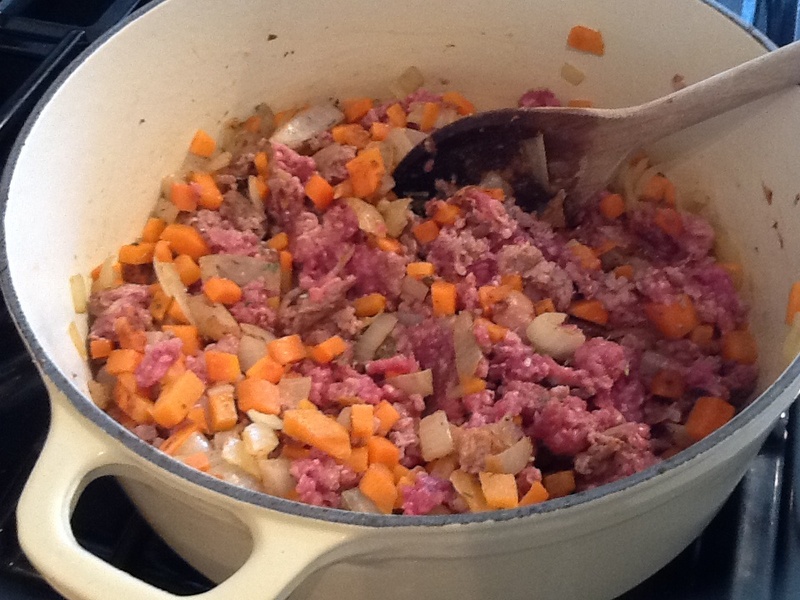 Add the lamb mince – with good quality meat you may find you need to break it down with a fork as it is much more “meaty” than cheaper products. 4. Add the cinnamon, thyme, parsley – then tomato purée and flour. Stir and cook the flour in before adding 500ml of good quality stock. 5. Simmer gently for 25-30 minutes. 6. Meanwhile peel, cook and mash the potatoes with a little warmed milk, butter and ground black pepper. 7. Top the meaty mixture with the mashed potato and some nice tasty grated cheese. On this occasion I used a Farmhouse Red Leicester as that’s my son’s favourite and he was joining us for lunch. Also my grandson doesn’t eat much meat so the creamy cheesy potato topping is great for his lunch too. 8. Bake in a preheated moderate oven for 25-30 minutes and serve on it’s own or with seasonal vegetables. Whoops – should have been a photo of a bubbling cheesy topped pie – but the family arrived starving hungry and I dished it up! My daughter suggested a photo of the scraped empty dish but I will add a proper one next time I make it. Its always a problem – you start taking photos and then everyone starts hassling to be fed and you never get the last pic! Absolutely right! Just forgot all about it. Will take one next time!